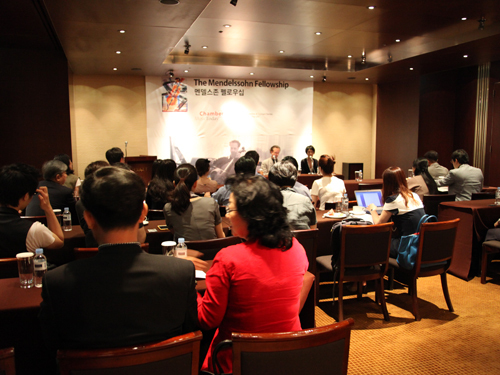 At a press conference at Seoul’s beautiful Namsan Hyatt Hotel, Jeehyun Kim, Executive Director of the Chamber Music Today festival, announced the inauguration of the Mendelssohn Fellowship. 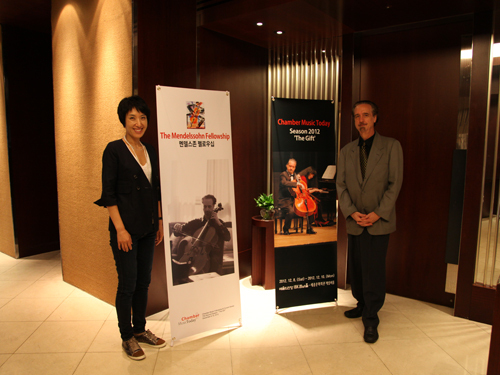 The program, which identifies and awards a young Korean musician a two-year budget to promote chamber music in Korea, is artistic directed by David Finckel and assisted by an international advisory committee. live streaming or distance teaching; music industry and/or education conferences; consultation expenses; and promotional costs. The Fellowship is named after the 19th-century composer Felix Mendelssohn, who greatly expanded the understanding and appreciation of music in his day. Attending the event were some 30 people: prospective candidates, Korean music teachers, and members of the press, including correspondents from the Chosun Daily, the Tongah Daily, and the Maekyung Economic Daily. 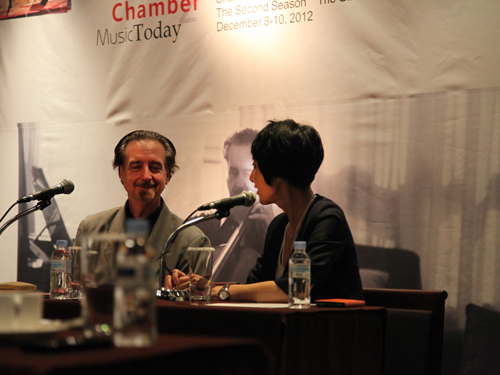 David, assisted by Jeehyun Kim, spoke for 20 minutes about his own introduction to chamber music as a young student, and described the challenges facing young chamber music players and the classical music industry in general. 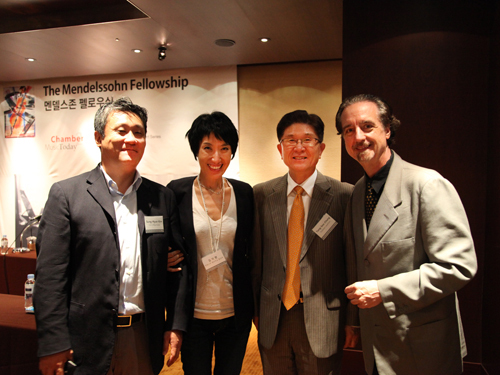 The Mendelssohn Fellowship is designed to address these challenges and to take advantage of the growing enthusiasm for chamber music in Korea. 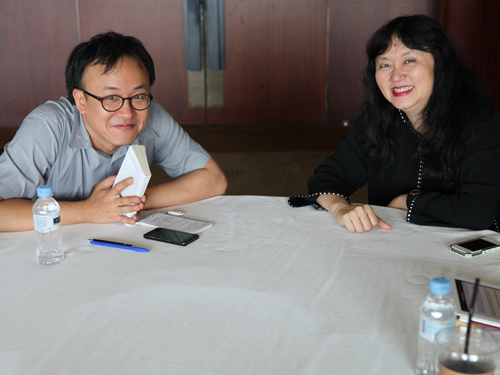 Prior to the press conference, David and Wu Han interviewed privately with the distinguished author and arts correspondent Sunghyun Kim. The event was also attended by two distinguished members of the advisory committee: T. S. Chung of the Yulchon law firm, and Sunghyun Kim, CFO of the LG U+ corporation. The winner of the first award will be announced at the final concert of the second Chamber Music Today festival, on December 10th, 2012, in Seoul. 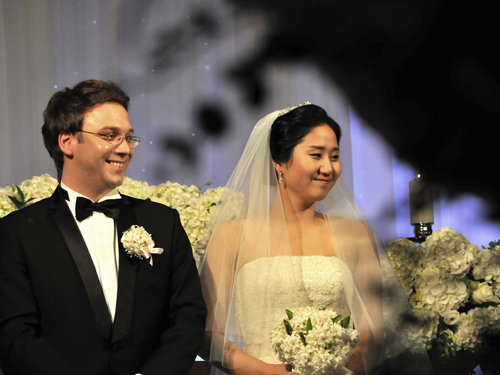 Providing enormous additional excitement to the duo’s two-day visit to Korea was the wedding of cellist Dmitri Atapine to pianist Hyeyeon Park, Music@Menlo International Performers Program alumni and now on the faculty of the Chamber Music Institute.